Why is it proving so difficult to supply Myanmar's Rohingya Muslims with aid? A recent shipment of aid from Malaysian Muslim groups arrived to protests in Yangon. When a ship crammed with 2,200 tons of rice, emergency supplies and aid-workers tried to dock at Yangon port on 10 February, it arrived to protests by hard-line Buddhists. The aid was from Malaysia, and part of it was meant to deliver relief to the Rohingya Muslims experiencing a brutal military crackdown in Myanmar’s Rakhine and Maungdaw states. The ship successfully docked in Bangladesh on 13 February. Initially the boat was banned from entering Burmese waters, but was later allowed through by Port Authorities, though expressly forbidden to enter a river north to Sittwe, capital of the Rakhine region. It was permitted to dock just outside Yangon, where it began to unload 500 tons of produce. The rest was destined for southern Bangladesh where up to 70,000 Rohingya Muslims have fled since the military crackdown in October and are living in atrocious conditions in official and unofficial refugee camps. They are displaced citizens, seen as illegal immigrants from Bangladesh in Myanmar, and illegal immigrants from Myanmar in Bangladesh. The government has reportedly returned thousands of Rohingya to Myanmar according to Amnesty International; the organization says it is a violation of international law, which states you cannot forcibly return people to a country where they are at risk of human rights violations. A group in Muslim-majority Malaysia, frustrated by reports of inaction and persecution in Rakhine, put an aid ship together to support the refugees. Unusually for Southeast Asian stability, Malaysia has been openly critical of Myanmar’s actions. When the boat arrived, a group of Buddhists, including monks, held up signs saying “No Rohingya,” One of the most vocal groups present was a faction of Buddhist monks belonging to the Patriotic Myanmar Monks Union, a nationalist group. Recent reports by the U.N. and its workers have said the death toll of Rohingya Muslims could number in the thousands and that the situation has worrying similarities to ethnic cleansing. Refugees from the group are not always welcome in Bangladesh either, where Amnesty International has reported “callous” actions against the minority. “Their desperate need for food, water and medical care is not being addressed,” said Champa Patel, Amnesty International’s South Asia Director in a November report. Here, Newsweek reviews the events that have led to Burmese Buddhists attempting to deny the distribution of aid to a needy minority, and the role both countries have played so far. Described by the U.N. as one of the world’s most persecuted minorities in 2013, there are around 1 million Rohingya in Myanmar, out of a population of 50 million. The majority live in Rakhine State, and speak Bengali, rather than Burmese. Many (approx 140,000 Rohingya) live in camps in Rakhine that they cannot leave without government permission. Why did Malaysia send aid? 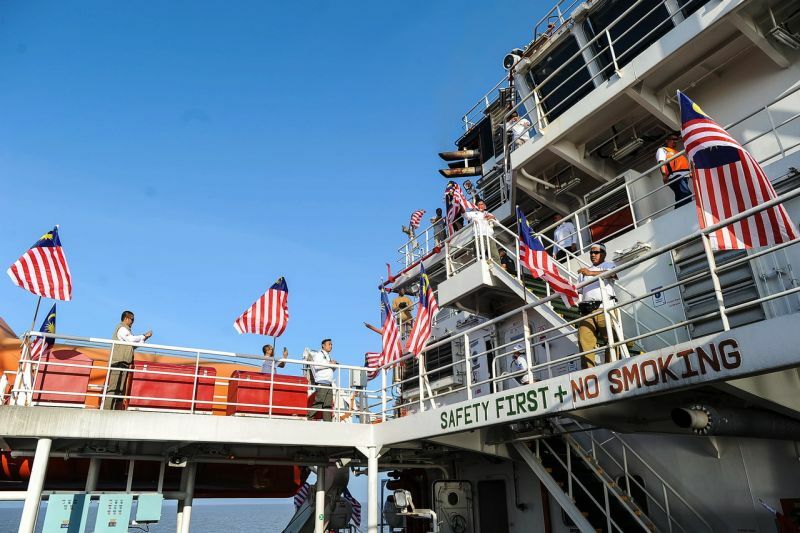 The Malaysian boat carried 1,000 tons of rice, 1,200 packets of instant noodles, hygiene kits, chapati flour, and a legion of aid workers. The aid has not come directly from the government, but was instead organized through the Malaysian Consultative Council of Islamic Organisations, and a number of local NGOs, including 1 Putera Club. As residents of one of the wealthiest Muslim-majority countries in Southeast Asia, many Muslims want to help their northern neighbors. "This must happen now…The government of Myanmar disputes the terms 'genocide' and 'ethnic cleansing,' but whatever the terminology, the Rohingya Muslims cannot wait," Razak said, according to Al Jazeera. Indonesia has also offered to act as a facilitator to ease the crisis in Myanmar, after Razak described Myanmar’s treatment of the Rohingya as a “stain” on the ASEAN bloc, and called on other countries to help. Why are people protesting against the aid shipments? For external observers, the presence of people protesting against the aid shipment might seem strange. For ordinary people, it could be considered a boon for a country to receive free aid in any context, but especially for people it does not see as citizens. However, monks believe they have a responsibility to defend and protect Buddhism, explains Matthew Walton, Aung San Suu Kyi senior research fellow in modern Burmese studies at St Antony's College, Oxford. “It can be difficult to say whether the people who are going to rallies or sharing their Facebook posts actually support [the monks’] specific aims or whether it’s just social pressure to support monks, especially when those monks present their activities as being done in defense of Buddhism,” he says. Why do some people deny the Rohingya exist? Some of the protesters meeting the aid shipment made claims there are no Rohingya in Myanmar. Despite the government having established a commission to look into Rohingya abuse, the government of Myanmar does not recognise the Rohingya as official citizens. The stance stems a concern over what could happen if the Rohingya were recognized as an official ethnic group. Is Bangladesh helping the situation? Not according to reports from rights organizations. Around 1,700 tons of the aid from the Malaysian ship is destined for the 70,000 Rohingya living around Cox’s Bazaar in southern Bangladesh, but proved difficult to deliver due to resistance from the government. On 3 February, the Bangladeshi government denied the ship access to Teknaf Port, but after a meeting between officials, it was agreed the ship could dock just outside Teknaf, an area where many Rohingya live in subsistence conditions according to Amnesty. Bangladesh sees the Rohingya as ethnically from Myanmar and the government has said it can’t afford to support more refugees. Authorities estimate between 300,000 and 500,000 unregistered Rohingya currently live in Bangladesh and the U.N. has asked Bangladesh to keep its border open to allow anyone fleeing violence to escape.